"For many years it was assumed by growers and keen collectors from the wild that any plant found in Mexico that had two coloured petals (namely white to yellow in the top half and reddish blue in the bottom half) just had to be a natural hybrid between a blue petalled species and T. schiedeana which achieved notoriety of being very promiscuous. This belief caused much discussion before T. chapalillaensis (P 28, 29 PHOTOS) was published in J Brom Soc 61(4): 169-173. 2011. The following discussion from Renate Ehlers shows the decision to publish was not taken lightly. 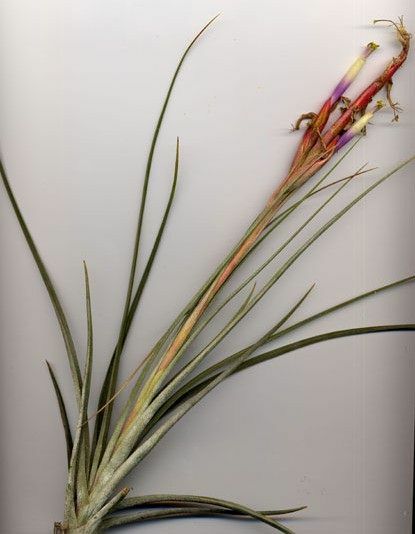 “I originally obtained this Tillandsia in 1992 from my friend Jürgen Lautner, Goettingen, Germany, who discovered the plant on his trip to Mexico in 1992. He thought this was a new species which I should describe. But when I saw the flowers, I was nearly certain, that it was a hybrid. The two-coloured petals seem to be a sign of hybrid origin. Juergen insisted that this plant is very common near Chapalilla and that he did not see any putative parents for a hybrid. – But I did not trust him! Nevertheless I made a description which I gave Dr. Walter Till in May 1992. 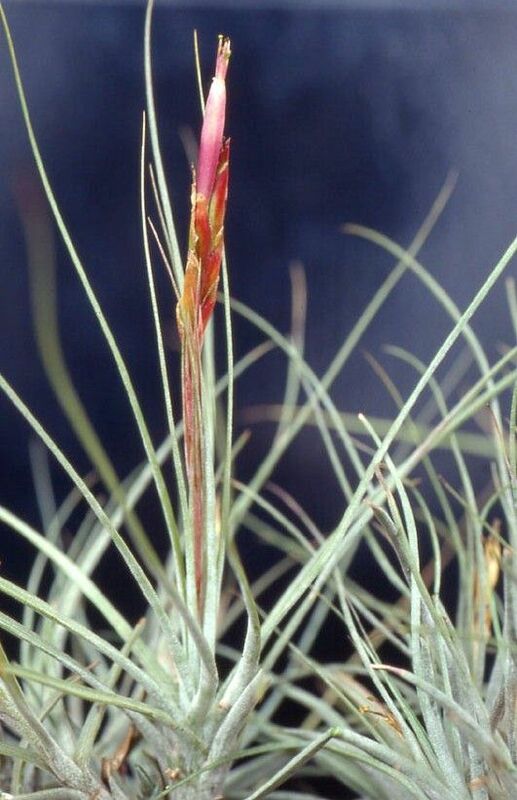 He commented that he thinks this is a hybrid between T. juncea and T. schiedeana. (P 30 PHOTO) I told Juergen his opinion which I shared, and that I cannot publish his plant as it is a hybrid. The plant grew very well in our collection and flowered several times. 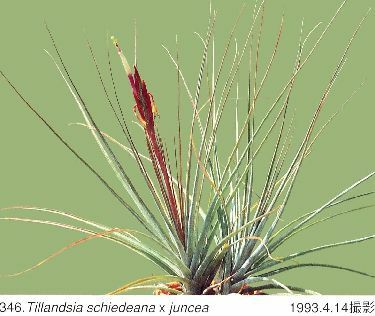 And Juergen had many little tillandsias growing pretty well from seed in the Botanical Garden in Goettingen and in his own collection. In 2004 I was on a trip in Mexico with Juergen and Ulrich Lautner, Manfred Kretz and Wolfgang Schindhelm. On February 18th, we were driving from Puerto Vallarta in direction of Tepic on the MEX 15, and we intended to go to the area where Juergen found his dubious plant, and I was very curious. About 18 km before we reached Chapalilla, we saw the trees coated with many tillandsias. I really was very, very surprised when I saw, that this was THE PLANT, growing here by the thousands. It was not the same place where Juergen had collected his plants in March 1992, only the same area. The trees were crowded with the tillandsias, mostly growing in big clumps, but there also were single plants. 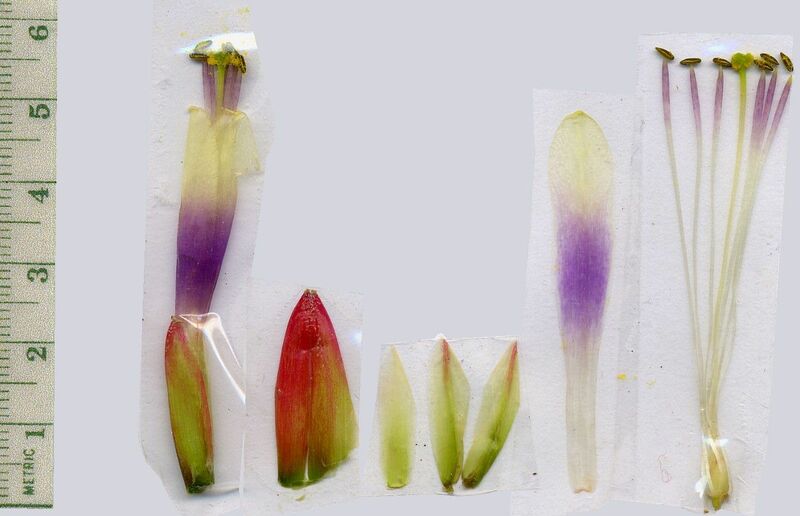 We also found a few T. pseudosetacea, T. achyrostachys and T. makoyana and rarely T. ionantha. The plant is growing in large numbers in this region, not only restricted to one location. There was not one T. schiedeana STEUDEL nor T. juncea SWARTZ growing at this location, and as well, we did not see any in the wider area. At the place where we collected, I would guess there were thousands of T. chapalillaensis, hundreds of T. pseudosetacea, tens of T. makoyana and T. achyrostachys and few T. ionantha. Now I had to admit that Juergen Lautner was right: the plant is not a hybrid but a good new species. Maybe, or more likely, the plants are of hybrid origin. When a plant has densely populated a large area in such huge numbers and is fertile, it should be treated as a species, not as a hybrid. In the meantime, Juergen Lautner has adult seedlings from seed he collected in 1992, that flowered in the Botanical Garden of Goettingen several times, and they all look alike. He gave this plant to many other Botanical Gardens and collectors of bromeliads. They all flower every year and no other tillandsia brings so many fertile seeds, in my collection all plants growing in the surrounding of T. chapalillaensis often are covered with seeds. Juergen and I had many discussions with friends about the plant and tried to solve the problem as to whether it is a hybrid or a species. 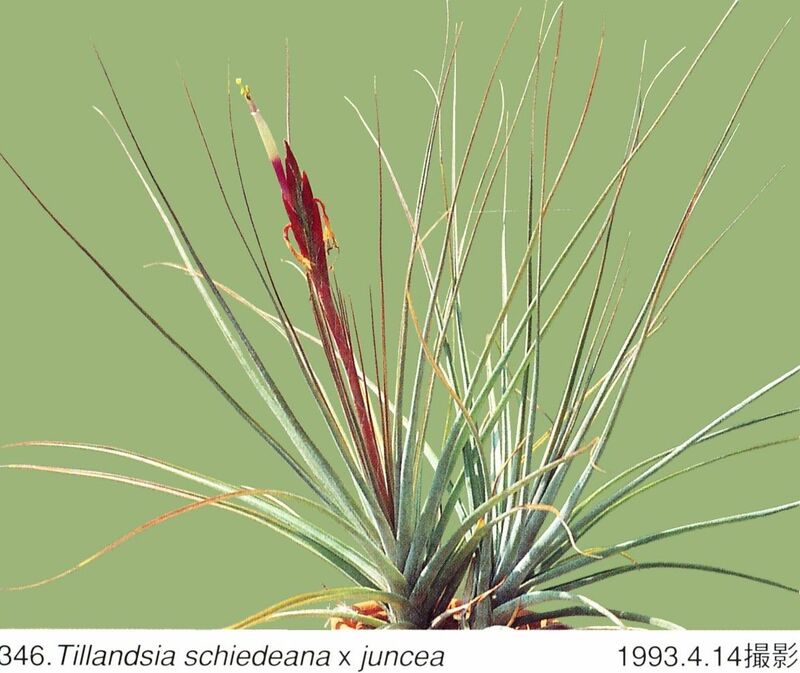 Hiroyuki Takizawa wrote that he thinks that the putative hybrid on page 109 of the New Tillandsia Handbook by Hideo Shimizu and Hiroyuki Takizawa is the same plant as T. chapalillaensis, and I agreed that it looks similar. He got the plant from Alfredo Lau without location. But I believe that the plant shown on page 109 is closer to a hybrid that we found in the Sierra El Tuito. This is recorded in the Natural hybrids data base on http://fcbs.org as T. schiedeana x query. (P31 – 33. PHOTOS) Derek Butcher did a lot of investigation of hybrids, and just now in the wintertime he sent photos of putative T. schiedeana-hybrids to me for discussion, and so he made me start working again and finishing the article. And I think, the Journal is the best place to publish the plant. We give the exact locality, where the plant is growing, hoping that some other collectors who come to this area, may be going to Puerto Vallarta, will take the chance to check, and may be they can write about their impressions in THE JOURNAL some day. And maybe there will be some more discussion about the evolution of a species and when is it classified as a natural hybrid. 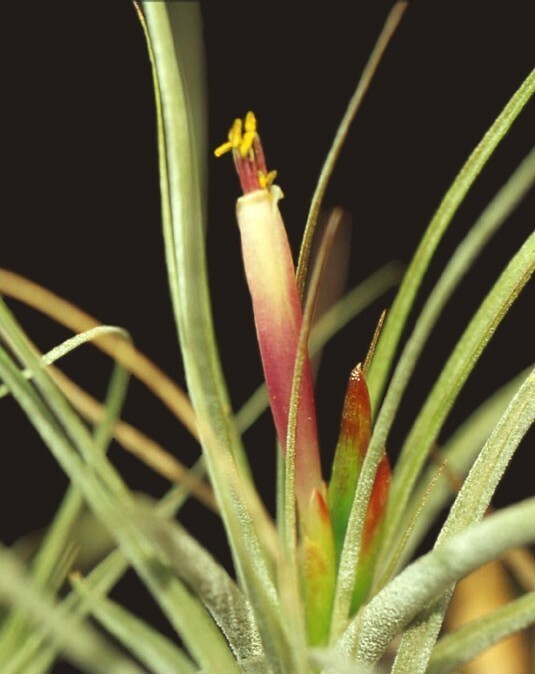 After checking the description and history of T. chapalillaensis Hiro Takizawa commented: “I guess there are many natural hybrids amongst Tillandsia which are believed to be species. Natural hybridizing is a part of evolution. When does a hybrid become a species?" This is an interesting question and not easy to answer. A large population is important, especially for consideration as a species. Maybe some hybrids grow better than the parents and make large populations. Then it becomes a species!